Custom CD/DVD ownership labels at Affordable Alternatives, Inc.
Our goal is to make ordering custom labels as easy as ordering our stock labels on the e-shop. <--- Click on the white & black label to see, order, or reorder all styles of white & black labels. 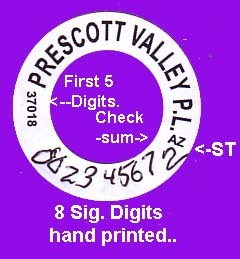 All of the 125CD/DVD labels are 1.25" in diameter (O.D.) with .75" hole diameter(I.D.). <--- Click on the white & red image to see examples of white labels with colors other than black pre-print. You may also order or reorder at the image with your color text. For re-orders input (as before) after text. There are 500 labels/roll. There are 48 rolls/case. <--- Click on the two color image to see & order all two color custom CD/DVD labels. Be sure to input the required text in the box provided on the cart & input (reorder) or (new instructions) for your initial order. You may order is any of these design categories: Glorious white with black pre-print, white with any other stock color print, or any stock color label with any color stock pre-print ink print. Custom hub labels 125CDDVD white with black text (24M/case) standard pack. Min. & Mult. 1 case. drop-shipped with FREE FREIGHT! Min. initial order 2M. Price/M. Custom hub labels 125DCDVD any color w/any color text (24M/cs) standard pack. Custom hub labels 125DCDVD White w/color text (ex black) (24M/cs) standard pack. Custom hub labels 125DCDVD white/black by the roll. Min. (& Mult.) 3M on les than standard pack of 1 case.